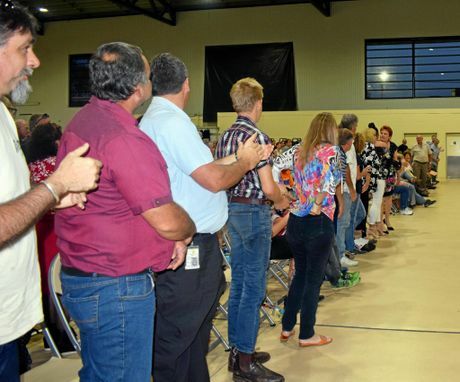 A STANDING ovation greeted controversial One Nation senator Pauline Hanson last night as she took her place among a 200-plus crowd of some her strongest Rockhampton supporters. 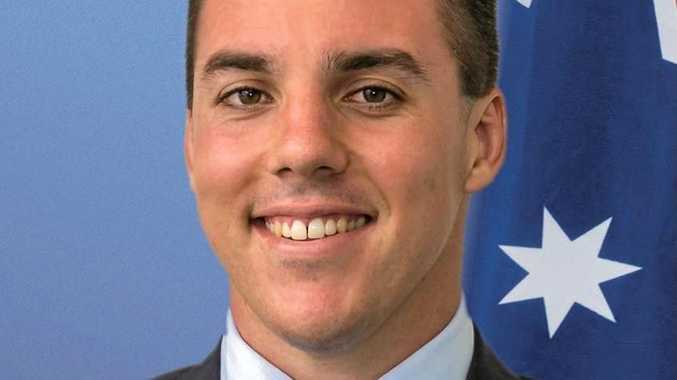 The reception was reminiscent of the response to Ms Hanson's maiden speech the Senate on Wednesday night, which featured strongly in her address at Rockhampton Showgrounds' Robert Schwarten Pavilion. Unwavering over her claims Australia was at risk of being "swamped by Muslims", and that family law needed an overhaul as women's "frivolous claims" would mean we "continue to see murders out of sheer frustration", Ms Hanson said she would stand by her statements which were "based on facts". 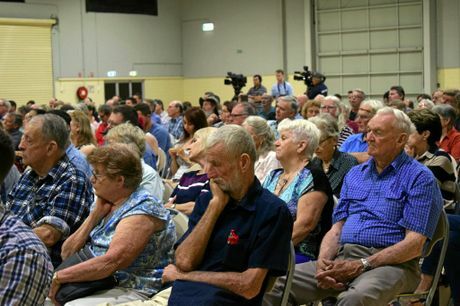 The rally and Pauline's presence in Central Queensland was at the invite of vocal Rockhampton businessman Dominic Doblo, who said his key concerns were immigration and jobs in the region. Touted as the LNP's number-one supporter throughout the Federal Election campaign only months ago, Mr Doblo denounced his backing and stated, "bugger the LNP, they don't want to do nothing... next election her (Pauline's) party will hold the balance of power" before passing the microphone to Ms Hanson. 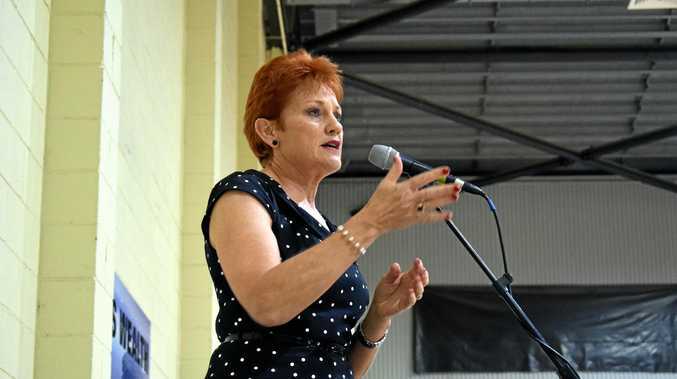 After sharing her two-decade-long desire to land her Senate seat, Ms Hanson did go on to sprook her plans for Rockhampton and greater Central Queensland. Her vision for Australia to become a "food bowl" filtered locally to a vision that rural areas be able to drought-proof themselves by building major water infrastructure. "I want a strong united society, a country," Ms Hanson said. "I want us to be the food bowl of the world, that we grow the food, they come to us and they buy it. "Here you are the Beef Capital of the world, but at present, because of the droughts, the farmers have had to sell their prime stock; what we need here to is to drought-proof ourselves, that's what we need. "We need dams, we need water, we need to be able to provide the water to the farming sector. Why won't they build the dams, why wont they build the infrastructure?" Ms Hanson went on to claim the Federal Government had privatised water following the 1992 Earth Summit. During her speech she made a point to denounce "international control" of food, products and water, but Ms Hanson threw her support behind the proposed Carmichael Adani Mine which she believes "should go ahead". Though, her concerns reigned back to water usage while sharing her disbelief that the mine, rail and port would have an impact on the Great Barrier Reef from climate change and ocean acidification. "When they say it (the mine) shouldn't go ahead because of the impact it will have on the Great Barrier Reef, I find that hard to believe," Ms Hanson said. "I believe I will be looking at that further and where they make that statement, but I spoke to (Deputy Prime Minister) Barnaby Joyce about it because I've got concern about the water that they will use, and it is a very good point - because if farmers cant get water that they need - you think to yourself why should we allow the Adani mine to go ahead and utilise the water?" With job creation featuring strongly in the crowd's concerns, Ms Hanson said she had seen regional areas become "ghost towns", with people chasing jobs in city centres. Her solution was a centralisation of Government jobs to rural areas, and to back another contensious development. "I have been pushing for Great Keppel Island resort to go ahead... it will create 1500 jobs, and I believe that's what the region needs, it needs tourism in this area," she said to a roar of applause."